I can't believe that VEILED MAGIC is out in less than two weeks! 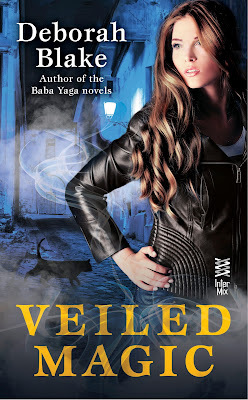 In case you haven't been around lately (in which case you missed a bunch of other great giveaways, but at least you're here for this one), VEILED MAGIC is an urban fantasy book that's an entirely different series from the Baba Yaga books. At least, it will be a new series if it sells well. At the moment, it is just a cool book to hold you over until WICKEDLY POWERFUL come out in February, but I think you'll like it. There's only one little thing--Berkley is putting this one out as an eBook only (unless it does spectacularly well). Now if you don't have an eReader, you can still buy it on Amazon and download the free Kindle app so you can read it on your computer. Or, you can enter this contest. Yes, that's a brand new, never been out of the box, KINDLE FIRE HD 7. Plus a $10 Amazon gift card, so the lucky winner can buy a copy of Veiled Magic to read on his or her new toy. As always, no purchase is necessary (although if you want to preorder Veiled Magic or Wickedly Powerful, you can earn a few extra points that way). If you want credit for posting a review, it has to be a new one, dated today or after--but it can be for ANY book I've written. You can copy an Amazon review you wrote previously and post it on Goodreads or B&N, too. Obviously, the point of this--besides rewarding one of my fabulous readers--is to spread the word about VEILED MAGIC as far as we can. You'll help me with that, right? Because this is such a huge giveaway, it will be running through Friday November 13th. (That seemed fitting, somehow.) The "Tweet about the contest" option can be used every day. I'll announce the winner on the 14th. I'll probably also put up flash giveaways here on the blog, on Twitter, and on Facebook right up until Veiled Magic comes out on the 17th, so be sure to check often! Tell me in the comments: Do you prefer to read in print, eBook, or both? And good luck!